This is my personal blog to share thoughts on current affairs, business and entrepreneurial ideas and what not! A Truth Seeker! Anti-War supporter! Wish to see Britain gets back to glory through peace and prosperity. Britain has made the choice to take control of her own future. The road ahead may be difficult and challenging. We are fully confident that the United Kingdom will show real character and step up to the plate to claim leadership of the 21st century through collective hard work, innovation and effective strategic implementation in local, national and international aspects of life. This is once in a lifetime opportunity for all of us to build again the real greatness of Great Britain. We vow to make this country a better place for our future generations. We aspire to work together for the day when our children and grand children will look back and thank us for our vision and courage. We have taken a giant step towards delivering peace, justice, welfare and a better life for our own people and the world. A good friend has come up with 25 reasons why we should REMAIN with EU. 1. Avoidance of war in Europe: It has been a huge success in averting conflicts in Europe since 1950 and only a united EU will sustain it. In my opinion EU lacks accountability, transparency and its functioning lacks democratic values. The whole structure of EU is inherently Anti-Democratic, as the EU commissioners are not even elected by the very people they rule over. The real power of EU lies with these commissioners who are nothing but bureaucrats who do not represent their people. How they make; amend and repeal laws is unclear. 1. EU Commission, the most powerful organ of EU is run by beaurocracy / civil service not electorates is totally un-accountable and not transparent. "The European Commission is more than simply a civil service for the European Union - it is the only body that can propose legislation." This rule by the few “chosen people” echoes autocracy. Therefore, EU can easily turn into a fascist regime very quickly. In a democratic environment people choose their leaders by voting. In return elected members remain accountable to their voters for their actions. With no check and balance system in place for European commission which is the only organization which initiates law in EU, the question of their accountability is a real one. 99% of people apparently do not understand how the EU secretariat works! It is so beaurocratic that it is difficult even for lawyers to understand who is accountable and who is not. My friend addressed the EU beaurocracy and sovereignty issue at the very end on points 24 and 25. However, did not address the lack of democracy and accountability issue through-out. There are multiple reasons behind the rise of the far right movement across the Europe. The two most important factors are economic austerity after the recession and the influx of refugees, mainly the Syrian refugees. We have witnessed EU member countries unable to strike a common chord against the intolerant anti migrant diatribes among their own people and political parties. Far right people are coming very close to win the national elections in different countries. Marine Le Penn in France, Norbert Hofer is Austria almost won their national election. The far right Law and Justice party have already won Polish election and ruling since 2015. The point is these all are happening in the full EU member countries and the EU is an utter failure to check their growth. The organisation doesn’t have any unified strategy to counter the far right claims across these countries. There is an alternative argument that EU policies are breeding far right sentiments. Europe is inclining towards far right over last couple of decades. Far right sentiment is something that needs to be dealt with. Remaining with EU is not a solution to stop rise of far right. It will keep rising and unless we identify why it is happening and how to stop it - we shall not be able to control or deal with it. First part of solving a problem is to identify the cause of the problem. How is that EU is solution to far right when far right is having a rise under EU? 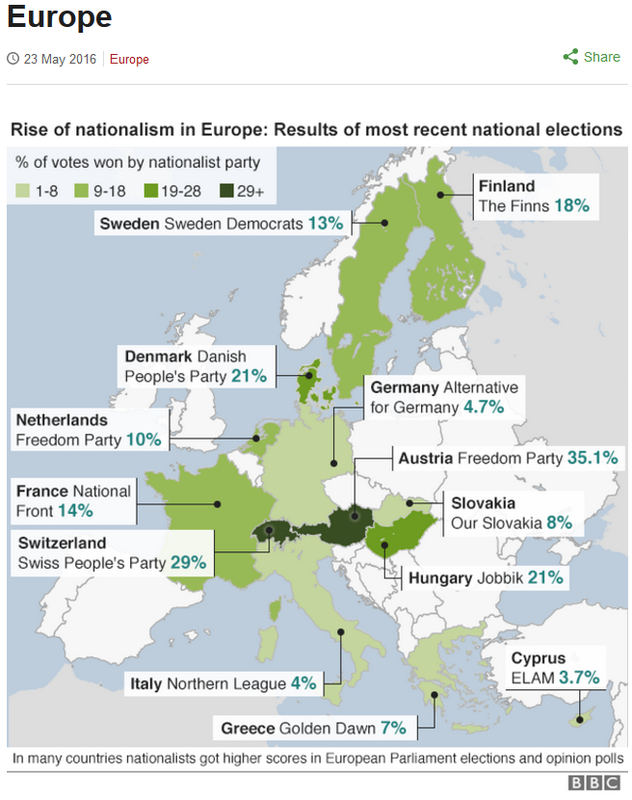 Check the BBC report and see how far right is rising across EU – not just UK. “Elsewhere in Europe, the Czech and Slovakian prime ministers condemned Greece’s inability to prevent hundreds of thousands of refugees from moving onwards to northern European countries. 5. All EU member states have to guarantee that its minorities have the right to freely practice their faith including Muslims. UK is by far the most multicultural country in the world. Muslims are always practicing their faith in the British Isles for decades. On the contrary there are widespread religious intolerance in other EU nations, namely the East European countries like Poland, Hungary, former Yugoslavia, Bulgaria and Rumania. France has banned women from wearing hijab in public places and Switzerland has restriction on the height of the mosque minaret in place. These are all signs of intolerance towards Islam and signaling out Muslims. Whereas in the UK Muslims practice their faith without any fear or persecutions. Being in Europe carries a greater danger of spilling the poisonous atmosphere in the UK. This is a generalized comment on such a vast field. UK wields its global power not because it is part of EU. UK’s global influence goes back many centuries and it is one of the five permanent members of the UN Security Council. On the international affairs UK is always playing a vital role and we have strategic security presence all over the world. On economic front, UK is considered to be one of the strongest economies of the world. We are the fifth largest economy in the world and we didn’t achieve it through our membership in the EU. This is another claim that is difficult to prove. Workers right is a complex issue and not a single organisation or law can safeguard their rights. There is no denying that EU is actively promoting workers rights. But they aren’t doing anything particularly for the UK as EU law is universal for all its member countries. I think we are capable to develop and enhance workers rights like many other countries around the world. We don’t have to be a member of the EU to ensure welfare of our workers. Our workers had rights before we were in EU. We lead the industrial revolution in 16th centuries onward without the involvement of EU. Although the City generates a healthy amount of cash for the UK economy they aren’t the sector contributing to the GDP. Certainly trade and commerce with the wider world is important to the UK economy as much as we value safeguard our border and maintain a good living standard for our farmers. Many EU legislations have pushed UK industries into the brink. Visiting our northern waters and the community living on the local fishing reveals the devastation EU has caused among the local fishermen. It wreaked havoc to this once rich and immensely profitable fishing industry. What now left behind is just a skeleton, a remnant of its glorious past. Numbers of start-ups are increasing. But that’s because of the helpful and resourceful working environment existing in the UK. London is considered as one of the most prestigious and sought after place and entrepreneurs want to ensure their presence here. This is cause of the magnetism UK has, the reputation of the British system and recognition of its plurality and dynamism. EU cannot take credit for that. Does that mean our places were unclean before? Or our councils are getting subsidies from Brussels to clean our streets and beaches as well. Yes, we are getting some funds and so are many other nations. Thanking EU funds for keeping our places clean is a sign of mental bankruptcy and is deeply offending to our own ability. UK have been in the EU only for 40 plus years but at no point before that we were branded as lacking creativity and dirty. I would rather challenge for a proof of the statement made. I am starting to believe that my friends of remain campaign are just plucking up things from the thin air without substantiating anything with evidence and numbers. That regeneration is still possible outside EU. I think we are doubting ourselves too much. The whole argument for the remain campaign is based on the fear of being lonely. They sound like there is no life or no countries outside the EU! This is completely absurd! We are living in a world of global connectedness. No matter what our status is we would always do trade and commerce with the rest of the world. Being a member of the EU doesn’t give us any leverage. 12. As a tourist or business traveler you find cheaper flights to travel across the entire EU and consequently outside the EU. Is it worth considering as a serious reason to stay when our farmers aren’t faring well in the local and international market cause of the tariffs and EU imposed restrictions? We are losing billions of pounds on our prospective national trade and commerce and considering cheap holiday will be considered as extremely narrow minded and myopic. For every British citizen going out to work and live in the EU, many more coming in. UK has the world class universities like Oxford, Cambridge, Imperial and LSE. These are the dream institutions every student around the globe wants to get in. we have one of the best healthcare systems in the world. People are always drawn in by our charm and London is one of the most popular destinations in the world. So we have more to offer than get. It should be for their interest they will keep coming in even after we leave EU. In the age of apps like viber, whatsapp, people are more dependent on wifi and data than having a roaming connection in their mobile. Asking someone to vote to remain in the EU and giving them a trivial benefit like this sounds like a joke. In any case, new legislations are coming soon across the Europe to reduce and in some cases abolishing the costly roaming cost. It is too small an issue to consider when sovereignty and democracy is at stake! Completely false assessment – please give evidence to prove it. Prove it with evidence pls. This is completely false. Progress of science is a global matter for the whole of mankind. This is not a European matter! I completely agree. However, we need to keep an eye that our agencies to not create terrorists as opposed to catching them. In my previous post I shared Trevor Aaranson’s work – Link again for viewing. Totally the opposite! Please do your research properly prior to claiming the earth in favour of your campaign! “(AM) 22. Europe can deal with the US and China on level playing friend and make a volatile, uncertain global political environment just that bit safer. Europe is not dying without UK, just 1/10th less bigger. It is still a massive force which can tackle China and USA. I just believe we shall contribute to our people and world more positively from outside the EU. 24. When you join any club or organistaion you have to be prepared to compromise and give and take. Each country gives up some sovereignty in that process but this is a healthy price worth paying for the huge benefits we gain. I have answered these points at the very start. Many thanks for your time and hope this helps you to assess your position on EU referendum. Hey there, this is Naufal Zamir, my thoughts and views and ideas and what not!